The CeWL application, i.e. 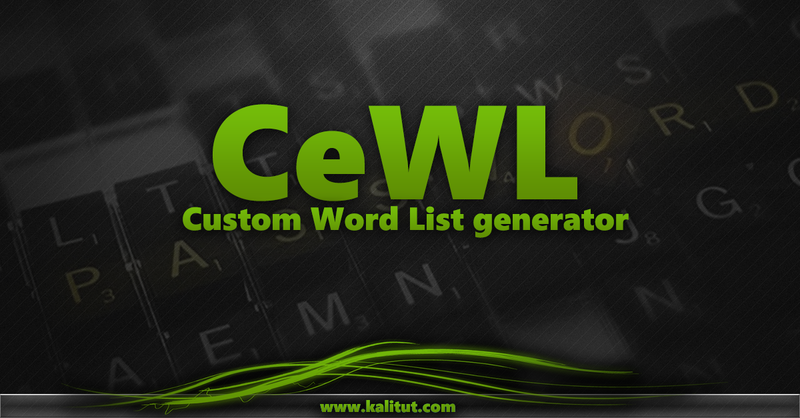 the Custom Word List generator, deserves attention due to its operation. The generator can create dictionaries based on the expressions found on the website provided in the parameter. The user can define the depth of search on the site, the minimum number of characters from which the password should be composed. In addition, the application as a crawler / spider tool can also collect e-mail addresses found on the website. As befits such applications, it also allows you to define a proxy server or log in using the HTTP Authentication mechanism. It seems to us that there is no point in describing all the parameters of the program because we assess the level of required English at the level of the preschooler's troglodyte. Below is a list of arguments for the Custom Word List generator for the lazy. Below is an example of using the CeWL hack program. The program is written in Ruby and already installed in the latest version of Kali Linux 2018 at the moment. -d 1 depth of search penetration ( recursive entering URLs found ). Below is an example of a generated dictionary. You can further process it with other tools such as pw-inspector, or a simple proprietary Python script that adds appropriate prefixes or suffixes to words. Created a personalized dictionary using the Custom Word List generator crawler in Kali Linux. As you can see, you do not need to use only the attached default dictionaries with passwords from the / usr / share / wordlists folder in Kali Linux. Such generators as CeWL , crunch , pw-inspector enable you to personalize passwords for a given penetration test. Most auditors create proprietary password dictionaries for a given safety test. There is no point in checking the big password vector, because your goal is not to break super strong passwords only to determine if your operating system, service or server is secure.